This Parker IM laque black ball pen is a giveaway that is bound to click with your customers. 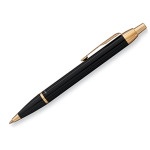 This handy black writing utensil has a fine lustrous lacquer finish and is made with a highly engineered manufacturing process to ensure quality. It is fitted with medium point black ink, and it is packaged in a stylish two-piece gift box. Customize with an imprint of your brand logo to create a memorable gift for doctor's offices, banks, hotels and more. I'm interested in learning about the Parker IM Laquer Black Ball Pen. Please contact me.